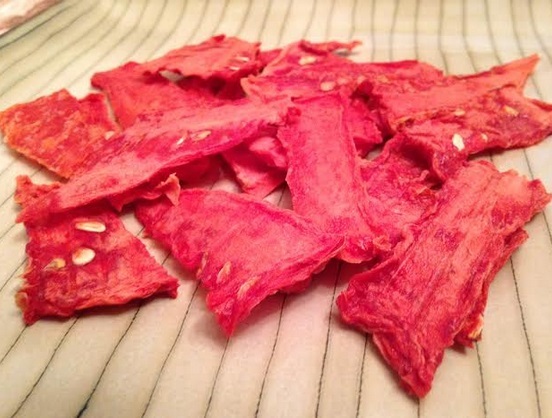 MY ATTEMPT AT MAKING WATERMELON JERKY - What About Watermelon? Have you noticed that as you get older, your Christmas gifts tend to get less and less memorable? Oh, sure, there are a few standouts from adulthood, like in 2001 when I received my very first MP3 player (which held a whopping total of 30 songs!). 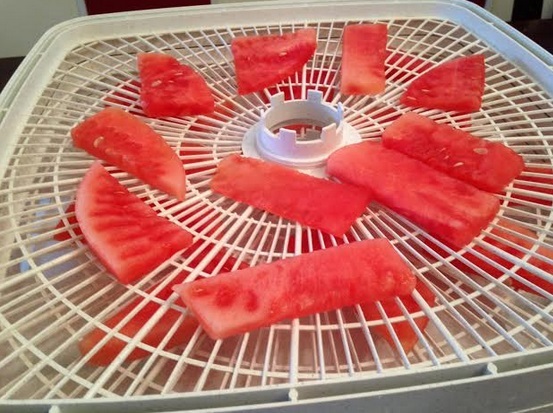 Last Christmas featured another highlight, when my wife bought me a dehydrator. 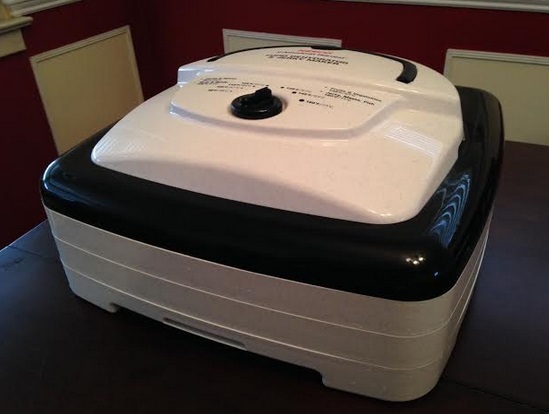 As a fan of beef jerky and dried fruit, I had been wanting a dehydrator for a long time, and unwrapping that gift gave me thrill that I hadn’t felt on Christmas morning in a long time. Since then, I’ve used it countless times to dry out various meats, but I’ve yet to use it to dry fruit – until recently. This past weekend featured my first attempt at creating watermelon jerky, and the results were surprisingly good. Then again, most things you place in a dehydrator tend to come out pretty good. The reason has a lot to do with the dehydrating process itself. In short, it’s a slow cooking process that removes almost all of the moisture from the food item. The result is a shriveled version of the original but with a condensed flavor. 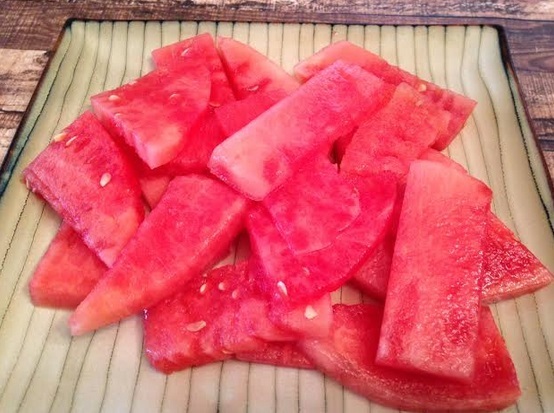 I started with a few dozen pieces of watermelon, which were cut about a half to a quarter of an inch thick. Like anything you put in the dehydrator, you want it to be sliced relatively thin. Slice it too thick, and it’ll never dry out, or it’ll be too tough and chewy. Slice it too thin, and it’ll dry quickly and be too brittle. Unlike beef jerky, which requires you to marinate the meat for several hours, watermelon jerky requires almost no preparation. Some folks add a little salt to their watermelon slices prior to drying them, so I sprinkled a little salt on half of my watermelon pieces. The other slices were dried without salt, just as Mother Nature had intended them. After setting the dehydrator to 135 degrees, all that was left to do was sit back and wait. Beef jerky takes about 6-8 hours, depending upon how thick the beef is sliced. Since this was my first time making watermelon jerky, I wasn’t sure how long it would take. I decided to monitor the progress closely – peeking in every few hours – to make sure I stopped the dehydrating process at just the right time. The wait was agonizing and took WAY longer than I thought it would (about 20 hours total), but the result was well worth it! The watermelon jerky was super sweet, chewy and tasted almost like watermelon candy. I’ve already started planning my next attempt at watermelon jerky, which I might create with the help of various savory marinades. Stay tuned! Do you think it could stay in the refrigerator after processing for several months?I have a lot of watermelon.